As you can probably tell by now, I'm absolutely obsessed with home decor! 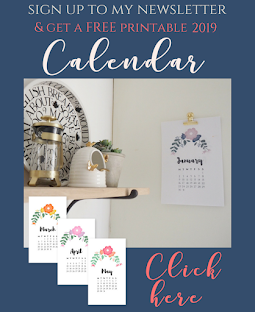 Whilst a few years ago I used to spend all my spare time browsing Topshop, and any spare pennies I had on nights out, now I find myself saving up for the latest Cath Kidston item or popping into Next Home to look at their new season range. However, something I found when we bought our first home was that whilst I knew exactly what colour schemes, wallpaper and furniture I wanted within each room, I wasn't sure where to start with the 'little bits'; the decorative things that really make a room. This was particularly true as we were working on quite a tight budget. 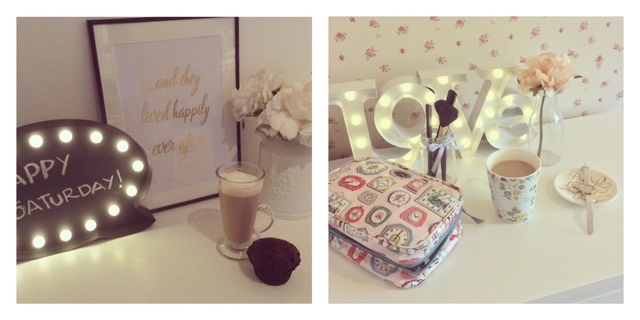 So I thought I'd list some of my favourite home shops and the pieces I've found there. My favourite home shop is probably Laura Ashley, it can be quite pricey however I've found that for 'big' items it's often worth spending a little bit more, especially to create a luxurious feel. So for things like wallpaper, curtains and rugs I often save up or wait for a sale/offer day (which they run fairly regularly) before I splash out. I've used Laura Ashley wallpaper to create a feature wall in both our master and spare bedrooms (both bought whilst they were running a 25% off discount day). I think they've definitely created the feel I was looking for in these rooms, which I can then add to with accessories from all over. Whilst in my spare room I've got Abbeville Pink. Another favourite of mine, although defiantly more for splurges and putting on my Christmas list is Emma Bridgewater. 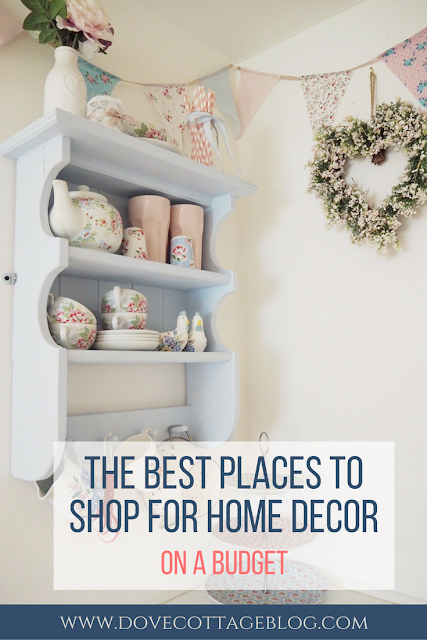 Their home bits are absolutely beautiful, and are perfect for creating that 'country cottage' feel I'm going for throughout my home, particularly in the kitchen. The few items I've got sit pride of place in my kitchen. I absolutely LOVE Next Home. They have some really beautiful bits in there for fairly reasonable prices, so often go there for pretty accessories and decorative pieces. They also always seem to have really great on-trend seasonal bits, meaning you can easily change your home around to suit the time of year. 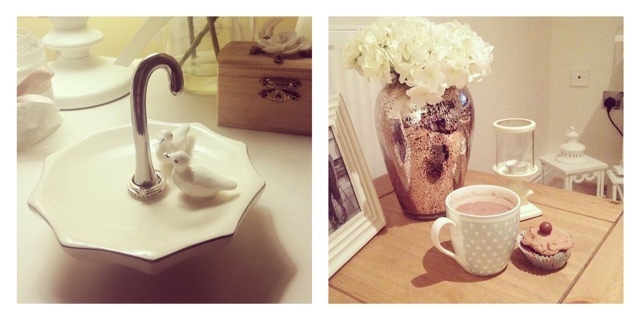 This beautiful dove ring holder (actually a present from my sister - she knows me so well!) made a perfect addition to my bedside table, and this bargain £12 vase is one of the centre pieces for the lounge. I'm also a huge IKEA fan, and they do some great furniture for really great prices. I always find I gravitate towards their Hemnes range, which is very shabby-chic in style, however they stock a huge range of styles which cater to all different tastes. 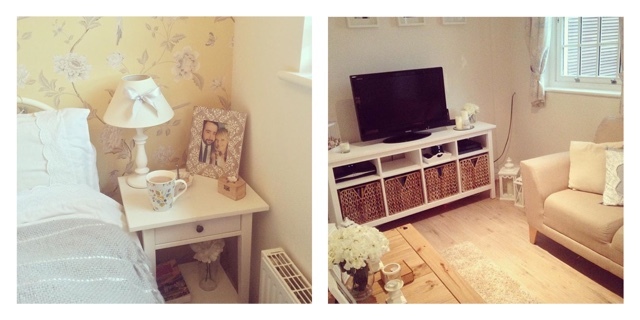 My TV stand, which creates the focal point in the lounge, was an IKEA buy about two years ago. On moving into our house I felt very overwhelmed with decorating this space, however purchasing this gave me the inspiration I needed and I designed the rest of the room around it. I also found our bedside tables in their Hemnes range too. Ikea also sell a huge range of really nice and very cheap accessories - I picked up these lovely milkshake glasses for £1.50 each, and my cake stand was just £12! Primark isn't just my go-to for bargain pj's or flip flops for the beach, they have a really great home range too, with lots of on-trend bits for absolute bargain prices. I recently picked up this LED chalkboard and 'LOVE' sign for £12 each, and a 4m length of fairy lights for £3.50. The other good thing (or probably not so good for my bank balance!) is that they regularly update their stock, so there's always something new in there to catch your eye. This is a fairly new find for me, but I would totally recommend having a look in your local store. You can often find some lovely pieces for complete knock-down prices - this GIGANTIC vanilla candle is still going strong in my lounge months after buying it in there for just £6. 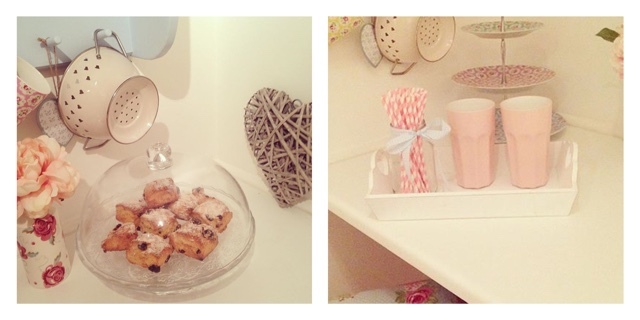 I also absolutely love making my own home accessories, which can be a very cost-effective (and fun!) way to fill your home, something I'll be blogging about soon. What's your go-to shop for home decor? Share your favourite places in the comments below, and don't forget you can pin the below image on Pinterest to return to later. 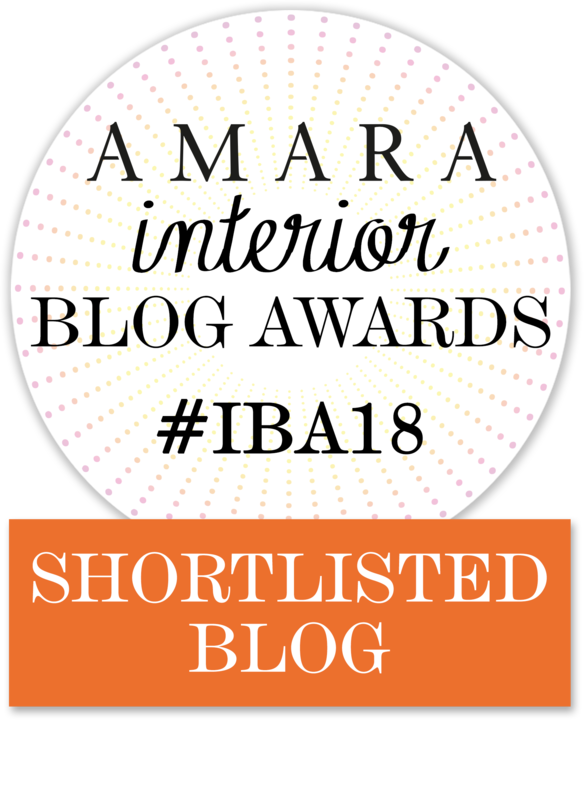 Love your blogs! Agree with you on Primark and home bargains - love those places (and Matalan, Tesco's and George plus the range! )I am trying to track down your serving tray with the hearts cut out. I cant find these anywhere, any suggestions on where to look, Thinking of buying a wooden one and painting it white. The strips have a similar kind of surface and Kerry Washington Skin Care shading that my bra has so it mixed in well and worked admirably of keeping any further harm (to me and my bra). You could paint every one of the dividers in the room - or only one - a profound shade of woods green or burgundy to run with the subject. You would then be able to purchase a blanket with a tree or bear theme for the quilt. عدد من المخلوقات الضئيلة بيضاء اللون قد تتمكن من تسجيل الضرر بأساس منزلك. قطع العفش التالفة والمدمرة إجماليًا وأيضًا خلل أرضيات البيت من أشهر الإشارات التي توميء إلى إصابة منزلك بمستعمرة هائلة من النمل الأبيض.